Life In A House of Blue ! : Clue - Harry Potter Edition ! Giveaway 2 WINNERS ! Home > Giveaway > Clue - Harry Potter Edition ! Giveaway 2 WINNERS ! Clue - Harry Potter Edition ! Giveaway 2 WINNERS ! My older boys who are 13 & 10 are HUGE Harry Potter fans. They love the books and movies. They were very excited wen I told them we had the chance to review the new Clue Harry Potter Edition ! 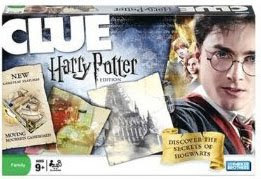 As a family we enjoy playing games and were thrilled to add the Clue Harry Potter Edition to our collection of games. My boys have always like playing Clue so we were interested to see what this edition had to offer ! It did not take them long to figure out the game, they had a BLAST ! It's Clue with a fanciful, magical twist! Players go around Hogwarts, trying to figure out WHO did it, with WHAT weapon, and WHERE. Hogwarts comes to life as the board itself shifts from turn to turn. Secret passages change, appear, or disappear! When the Dark Mark appears, various events happen that would cause unprepared players to lose valuable House Points. Lose them all and you're out of the game! Based on the popular Harry Potter movies, CLUE: Harry Potter Edition invites players to take on the roles of the iconic wizard characters and discover the secrets of Hogwarts School of Witchcraft and Wizardry. A student has vanished from the school, and it is up to the players, taking on the roles of Harry, Hermione, Ron, Ginny, Luna or Neville, to race through the halls of Hogwarts to discover who did it, what spell or magical item was used and where the student was attacked. Was it Draco Malfoy with a Sleeping Draught in the Owlery? Or m aybe it was Dolores Umbridge with the Vanishing Cabinet in the Great Hall. From the Potions classroom to the Room of Requirement, players can equip themselves with spells and magic items as they face unexpected challenges and race to avoid the fear-inducing sign of He Who Must Not Be Named, or Lord Voldemort (to the brave), the Dark Mark! Game Objective: Navigate through the corridors of Hogwarts School of Witchcraft and Wizardry and discover clues that will help uncover the secrets that will reveal who made a student vanish, what spell or item was used and where the crime was committed. Game Play: Each player is the holder of several clues that may help determine which witch or wizard used their powers for dark purposes. By rolling the die and moving through Hogwarts, players discover clues which will help them guess the solution to the puzzle. But, they must make sure the accusation is well thought out – if a player guesses incorrectly they will be out of the game! The winner is the first player who correctly makes an accusation in Dumbledore’s Office of who committed the crime, the spell or magic item used, and where at Hogwarts the crime was committed. At the roll of a die, the game board can change, turning doors into brick walls, opening secret passageways or revealing a Dark Mark, a sure sign that Dark powers are being used at the school. Each time the Dark Mark appears on the game board or on the special Hogwarts die, players draws a “Dark” card, which describes an event most likely caused by a dark force. The students are not alone in the quest to solve the mystery. During the game, players will have use of “Help” cards that will provide a special power to protect against Dark forces or provide the help of an ally. Players take on the roles of Harry and his friends, and accuse witches and wizards associated with the Dark Arts of committing the crime in the halls of Hogwarts. Players can earn (and lose) house points as they pick up Help and Dark cards throughout the game. game board, 6 movers, 33 Help cards, 33 Dark cards, 21 Mystery cards, 1 notepad, 40 house point tokens, 6 suspect tokens, 6 item tokens, 1 envelope, 2 standard dice, 1 Hogwarts die, 4 wheels, 4 plastic rivets, 1 label sheet and instructions. Clue - Harry Potter Edition ! My husband would love the Star Wars - Saga Edition Chess Set -- he's a big fan of Star Wars and he's always trying to convince me to learn how to play chess! Winners have been emailed, you have 48 hours to reply ! I'm also following you on twitter and have tweeted about the giveaway. I'd love to try Monopoly: World Edition! I would love to get the Star Wars - Saga Edition Chess Set. 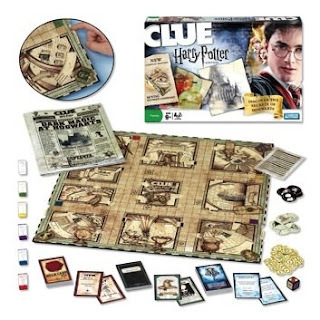 I would love to win the Harry Potter Clue Game. The other game I would love is the Monopoly World Edition. Our family is big on games and these would keep us occupied for a long time! I am following you on Twitter as networkingwitch and I also tweeted about this giveaway. I think Pictureka! would be a fun game to have! Have you on my blogroll,bottom left hand side of my blog! I'd love to have Trivial Pursuit 25th Anniversary Edition! Risk has been around for 40 yrs and I have never played it, so that would be my choice. I think having the Trivia Pursuit, 25 years one would be great. I love trivia, even if I'm not very good at it. Please enter me. I'd like to play Trivial Pursuit 25th Anniversary Edition. I'd love to own The Game Of Life Twists and Turns. We used to play the Original Game of Life as kids, so it'd be fun to play the new version! Thanks for the giveaway!! I'd like to add Monopoly Deal to my games. I'd also like to have the Monopoly Here and Now world edition! I would like to add Gator Golf to my collection. Cranium Hullabaloo is a game I would love to get for the kiddos.. I'd love to get the Trivial Pursuit Totally 80s edition. I have almost all of the games except that one. My family would like the game Operation. i'd like to get monopoly world edition. 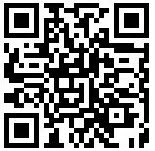 neenee838@yahoo.com i subscribe via email. I would love to add MONOPOLY Brand Electronic Banking to our game collection. No more having to mess with the fake money. I'd like to have the SCRABBLE Brand Crossword Game Deluxe Edition. I would love this one, but I'd also like the are you smarter than a 5th grader game. I think my little guys would love the Dora The Explorer Chutes & Ladders game. I also like the monopoly world edition! I would LOVE pictureka. Thanks for the chance. I would love to add the Star Wars Saga Edition Chess Set to my game collection. I also like the PLAYSKOOL GLIDE 2 RIDE Bike (Blue). I love Harry Potter and have the dvd game. One of my favorites is Yahtzee. thanks for the chance. I almost bought the Harry Potter game myself, but I figured I might be the only one in the house to play it! I have never played Yahtzee and would like to buy it too. I would like the monopoly express game. RISK game. it's what boys do. Monopoly is an all time favorite! I would love to try Partini too! I love playing board games with friends. Any of the Trivial Pursuit games I'd like to have. we have a really outdated one, probably the totally 80s (which kind of contradicts the outdated issue lol) or the dvd pop culture one. 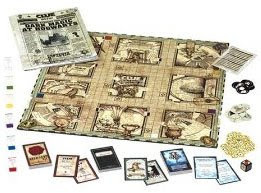 We love playing clue as well I think this edition would bring an interesting twist to it. My family would also enjoy "Monopoly World Edition". We are big board game lovers! I want to add Risk to my collection. Ooh! The Scabble Deluxe looks fun! Hasbro - I would like a new game of Life! I gatta get a Playskool Dance Cam. My granddaughter would really love the MEMORY TOUCHADOO Dora the Explorer Game. Thank you! If they still sell it I would want Don't Spill the Bean's. I think I would want to get the silly 6 pins game, or I'd want to try Disney's Magic Kingdom game, or Guess Who, I love Guess Who! We want to buy Sorry! My son has played it at school and he really likes it. I'd love to get the Trivial Pursuit 80s edition. I have most of the sets except that one. I would love to add TRIVAL PURSUIT DVD 2 Pop Culture Game to our game collection. Thanks! My grandchildren would love this. I've always like scrabble and I think it's a great learning game for kids! I would love to have the Monopoly Disney Pixar Edition. I love playing Monopoly (when I can find someone who is willing to play it with me).